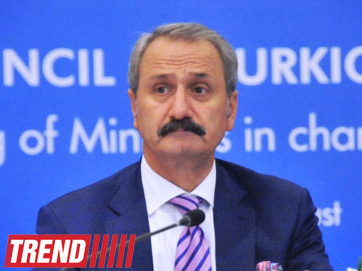 Turkish Minister of Economy Zafer Caglayan said that Turkey was ready to cooperate with Denmark on a global level in order to surpass the global economic crisis, Anadolu Agency reported. "It is not for sure when the 10 out of the 17 Eurozone countries are going to return to their economic situation before the crisis. It will take 5-10 years of time for some countries," said Caglayan at the Turkish-Danish Business Forum in Copenhagen, Denmark. "The way out of the global crisis lies in global cooperation. On this matter, Turkey is ready for a global cooperation with Denmark." Caglayan said that the 1.7 billion dollar trading volume between Denmark and Turkey was not enough and that both of the countries should learn each other's advantages in order to reach the 5 billion dollar trading volume. Caglayan saidTurkey had raised its exports in 2012 by 13.1 per cent and that the direct foreign investment to Turkey had risen to 124 billion dollar in the last 10 years.
" Turkey receives direct foreign investment because of our country's logistics, implementation of the free market rules, geographic location, its population of over 75 million and 30 years average young population," said the Minister of Economy. Caglayan called out to the Danish businessmen that they should not perceiveTurkey as just one country but should see it as a country that is four hours away from 56 countries which is populated with 3/4 of the world's population and produces 1/3 of the world's income.